Make yourself at home in one of the 32 air-conditioned rooms featuring kitchenettes. Rooms have private balconies or patios. Conveniences include refrigerators and electric kettles, and housekeeping is provided on a limited basis. Featured amenities include a computer station, express check-in, and express check-out. A shuttle from the hotel to the airport is provided for a surcharge at scheduled times, and free self parking is available onsite. Enjoy recreational amenities such as an outdoor pool and an outdoor tennis court. The complimentary beach shuttle makes getting to the surf and sand a breeze. This hotel is built in Cretian village style and consists of several buildings surrounded by magnificent gardens. The sea is just across the road, and a small bathing cove is located near the hotel. The nearest beach lies about 100 m away. Análipsi lies 1.5 km away and Chersónissos can be reached in 6.5 km. The tastefully furnished rooms at this modern hotel ensure comfort for their guests. The well-tended outdoor complex features both seawater and freshwater swimming pools, each with children's paddling pool. Guests can also cool off with a refreshing drink from the poolside snack bar. Sports enthusiasts will be thrilled with the tennis and basketball courts. Travellers can enjoy all their meals in the main restaurant which is set up in buffet style with a variety of Cretan, Greek and international cuisines. This property is 1 minute walk from the beach. 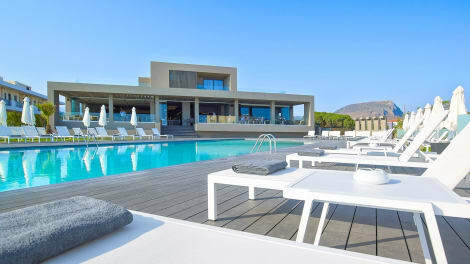 Featuring an outdoor pool and a restaurant, the beachfront and 5-star Elysium Boutique Hotel & Spa offers accommodation in Analipsi of Hersonissos. Free WiFi is available in public areas.All air-conditioned rooms are fitted with a TV, fridge and safety box. Every room includes a private bathroom with free toiletries and a hairdryer.Only 2 km from the centre of Hersonissos, a place popular for the lively nightlife, the waterslide beach, bars, sports and extreme sports, bungee jumping, carts and shopping centres, close to the beach. A supermarket can be found at a distance of 20 metres, while a bus station is 300 m away. Aquaworld Aquarium is 5 km away and the nearest airport is Nikos Kazantzakis Airport, 15 km from the property. Make yourself at home in one of the 262 air-conditioned rooms featuring refrigerators. Wireless Internet access (surcharge) keeps you connected, and satellite programming is available for your entertainment. Private bathrooms with shower/tub combinations feature complimentary toiletries and hair dryers. Conveniences include phones, as well as safes and blackout drapes/curtains. Serita Beach Hotel is located in Anissaras, 3 km from Hersonissos. The 5-star hotel features 2 seawater outdoor pools, while sports facilities include 2 tennis courts. The hotel’s beach features a selection of water sports. All guestrooms are carefully appointed with a typical Mediterranean décor. Each features Individual air-conditioning and heating, bathroom with hairdryer, a mini fridge and satellite TV. The all-inclusive Serita Beach offers drinks, snacks and meals throughout the day. There is a main restaurant, a tavern-snack bar- pizzeria, pool bar, lobby bar and early breakfast and lunch baskets are offered. Sun beds and umbrellas surround the swimming pools. Young guests can splash around in the separate children’s pool or make new friends on the playground. A mini club, games corner, disco and 6-day animation programme are also provided. A multilingual team also provides a light entertainment programme, including sketches, gymnastics, aerobics, shows and water ball games. Folklore and barbecue evenings are organised regularly. Serita Beach Hotel is 22 km from Heraklion Airport and 24 km from downtown Heraklion. Mitsis Laguna Resort is located on Anissaras sandy beach, only 3 km from Hersonissos. Sports and leisure facilities include a free-access tennis court, and a spa centre. There are 2 swimming pools on site. The elegant rooms and bungalows are air-conditioned with LCD satellite TVs. A minibar is available with free drinks. All rooms feature a balcony or terrace. Bathrooms come with toiletries, bathrobes, slippers, scales and hairdryer. Mitsis Laguna Resort features 7 restaurants, offering cuisines that range from Mexican, Cretan and Italian, to Asian and Sushi. There are 5 bars on site, including a champagne bar. Two of them are set by the pools, and 3 in the main building. A full animation program, children’s pool with water slides, outdoor playground and playroom are available for young guests. Umbrellas and sun beds are provided on the beach and on the poolside. 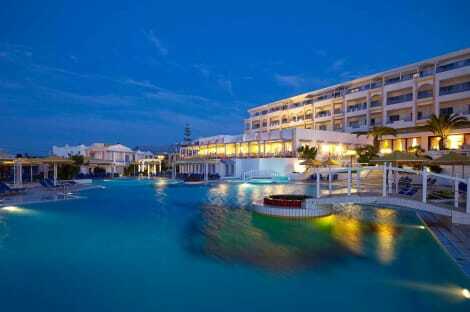 Mitsis Laguna Resort & Spa is 24 km from Heraklion Port and 22 from Heraklion Airport. Free parking is available on site, while car, motorbike or bicycle hire is available through reception. lastminute.com has a fantastic range of hotels in Anissaras, with everything from cheap hotels to luxurious five star accommodation available. We like to live up to our last minute name so remember you can book any one of our excellent Anissaras hotels up until midnight and stay the same night.